Recently one of our users contacted us about a notice they received from BlueHost (one of the recommended WordPress hosting providers) about upgrading to PHP 5.4. We thought it would be beneficial to cover how this affects WordPress users and website owners. In this article, we will explain how PHP updates by your web host impact your WordPress sites. We will also discuss the things you can do to avoid any conflicts or downtime on your website. A PHP update by your web host is supposed to go smoothly, but it can also go terribly wrong. It all depends on your web host, and how they configure their servers. This is why we recommend our users to choose the best WordPress hosting, so they know that there are top-notch engineers who are looking after those servers. Choosing an unreliable web host for your WordPress site can cause unexpected downtime during or after the update and there is pretty much nothing you can do about it except switching to a better host. WordPress is developed using the open source programming language PHP. At the time of writing this article, WordPress requires PHP version 5.2.4 or greater. The current stable version available for PHP is 5.5.7. Most shared hosting providers are currently offering PHP version 5.4. * installed on their servers. Some web hosts may even allow you to change your PHP version from their control panel. There are various reasons for not using the bleeding edge and the newest stable versions of PHP by web hosts, but the most common reason is that the latest versions can sometimes break some PHP applications. However, they also don’t want to stay far behind. Currently PHP 5.4. * is used by pretty much most shared WordPress hosting providers. Your web host is probably already hosting thousands of WordPress site. They will take every precaution they can to make sure that everything goes smoothly and customers don’t feel any glitch in the service. The notice you have received allows you to be informed about the update and keep a look out to see if anything goes wrong. Although it is unlikely that this update will break things, it is always good to have a fallback plan. First of all, we always recommend our users to regularly backup WordPress sites. If you do not have an automatic backup solution in place like BackupBuddy, VaultPress, or BackWPup, then it is time to install one of them or at least create a manual backup of your website. After backups, the next thing you need to do is to make sure that you are running the latest version of WordPress. Also make sure that all your plugins and themes are up-to-date. Go to Updates screen and install any updates available. 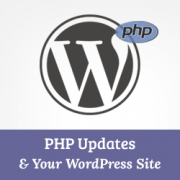 WordPress itself and most popular WordPress plugins will not be affected by PHP update. However, it is possible that some plugin may stop working. If a plugin on your site has stopped working due to a PHP update, then you need to contact the plugin author for support or find an alternative. What to Do if a PHP Update Breaks your WordPress Site? There are very little chances of a PHP update breaking your WordPress site. However, with the abundance of free and paid plugins, a single line of poor code can result into an error. The first thing you need to do is make sure that it is not a plugin or theme causing this error. To do that deactivate all your WordPress plugins and switch to a default WordPress theme. If this does not solve your issue, then contact your web host’s support team. There is a good chance that the issue you are facing will already be in their notice, and they will be able to assist you. If your web host is unable to help you out, then try to install a fresh copy of WordPress and then restore your WordPress site from backup. If none of this helps, then perhaps it is time to change your WordPress Hosting. We hope that this guide helped you understand how PHP updates by your web host impact your WordPress site. For feedback and questions please leave a comment below. Thanks for such useful articles by your excellent editorial staff. I would really appreciate if you could let us know as to which PHP handler is being used on this website – Really impressive that WPB loads fast even with such high traffic. As per info available on this topic DSO is supposed to be faster than suPHP, but it is really unclear as to how fast DSO is in comparison to suPHP (secure, stable and works well with wordpress). This is an important criterion for a beginner with a limited budget who has so many starting expenses. But it should not be the main guiding force. In the long run, cheap may not necessarily be the most economical. If the level of services is good then a little investment will pay for itself through better performance. Look for web hosting plans offered by affordable companies which provide quality with reasonable rates for web hosting. Perfect timing; I just got that same email a couple weeks ago. BTW, I’ve started referring my clients to your website for tutorials. Fantastic content . Do you have a current article on good hosting? Your archived article from 2009 is outdated and recommends host gator! Yes we still recommend HostGator. The PHP update by Bluehost broke the checkout page on my WordPress site. Items added to the cart did show up in the cart page at checkout, but the cart icon in my header said the cart was empty. In addition, when the button for “enter credit card info” is clicked, it triggers an error message that says invalid shipping method. Bluehost agreed to switch me back to PHP 5.2 temporarily, but said at some (undetermined) point in the near future they will switch to the new version regardless. How do I fix this? Thx! It’s not PHP updates that break WordPress websites or plugins. It’s not updating WordPress (or plugins) that breaks when PHP is updated… BTW, the WordPress core and most plugins I use run perfect with PHP 5.5. Most hosting providers will keep an older PHP version available for customers to temporarily switch back to when something goes wrong. Where I work, 5.4. * is the default and both 5.5* and 5.3* are available. Version 5.3 until PHP drops the support for security updates. This will ease the fixing of older, poorly maintained plugins. Another item to watch out of is that plugins and other applications that have been protected with older versions of Ioncube might stop working when the PHP version is changed. The developer of the plugin or application needs to update their Ioncube protection first. Once you make the change, you need to make a list of all the plugins & applications you are using and go through then one by one to check for functionality with the new php. That said, I am running bleeding edge PHP with the latest WP and apart from applications that were protected with old Ioncube versions, everything is running smoothly. I’ve noticed my host allow me to choose what version of PHP I want to use for each site hosted on a shared account. After reading this I will use that option with caution. Get 44% off Web Hosting Hub hosting plans.